Ald'ruhn Arms Master is a rare Strength creature card. It is part of the Houses of Morrowind expansion. In addition to the card's availability in the Houses of Morrowind expansion, two copies are included in the Redoran Onslaught theme deck. "And now for a practical demonstration." The card is named for Ald'ruhn, a town on Vvardenfell which first appeared in Morrowind, and later reappeared in ESO. 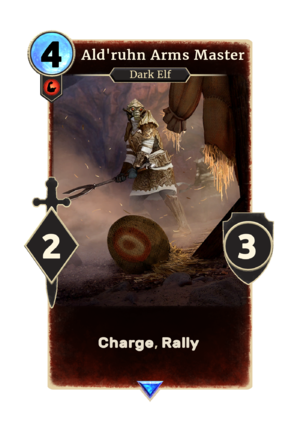 The card's art depicts a Ashlander wearing their garb as it appeared in ESO. This page was last modified on 3 March 2019, at 13:55.